People sleeping rough are the most visible form of homelessness and with the numbers increasing year on year, Pro Bono Australia News spoke to people on the ground about what you should do if you see someone sleeping rough. Feature: People sleeping rough are the most visible form of homelessness and with the numbers increasing year on year, Pro Bono Australia News spoke to people on the ground about what you should do if you see someone sleeping rough. Former homeless man Kevin Fenn spent nearly six months sleeping rough in Melbourne after problems with a neighbour left him fearing for his life. After grabbing everything he could “put in a couple of bags”, he hit the street and over the course of several months found himself sleeping on park benches, in a toilet block at the back of a disused police station in Richmond and under a road bridge in Hawthorn. Sadly Fenn is just one of many. On any given night there are thousands of people sleeping rough on Australia’s streets. According to the 2011 Census 105,237 people were homeless in Australia five years ago with the number of those sleeping rough reaching 6,813. Since then, the figures have increased. A recent City of Melbourne survey claimed the number of people sleeping rough had increased by 74 per cent compared to just two years ago. The StreetCount survey, which saw 160 volunteers take to Melbourne’s streets to count the homeless, recorded 247 people sleeping rough in the CBD, a substantial jump from 142 people in 2014. It is a problem that is all around us. 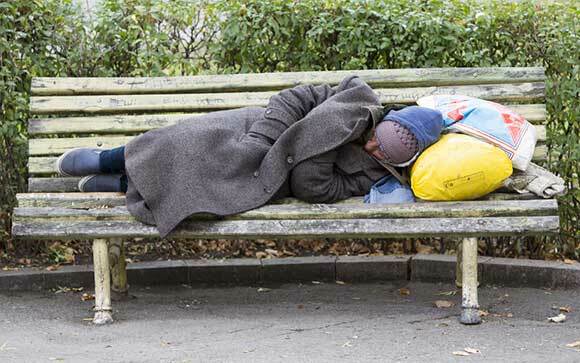 But what should you do if you see someone sleeping rough? Last week Prime Minister Malcolm Turnbull faced backlash for dropping a $5 note into a homeless man’s empty coffee cup. Some argued he should have given more than $5, especially as a photo of the incident, that has since gone viral, shows the prime minister had a wad of cash in his other hand. Others said that giving money to the homeless is a problem and is sending the wrong message. Turnbull defended himself saying that he “felt sorry for the guy” and it was “a human reaction”. Fenn told Pro Bono Australia News he wasn’t “too keen” on people handing over money. “It seems a sort of strange thing of me to say because it [asking for money] wasn’t something I found myself doing, I sort of prefer to have you know someone maybe point out services or things like that,” he said. “One of the best things that I encountered… one night, while sleeping under the bridge, there was a security patrol that used to come past every night … one night the security guard stopped and sort of made his way over to my little niche where I was hiding out and sort of sleeping and he handed over a bag. He had obviously just been down to 7/11, it had a couple of drinks, a couple of sandwiches, and he also gave me a jumper, a hoodie and I just thought that was one of the best things that had happened to me and sort of restored my faith in humanity. Fenn said one of the problems homeless people faced was feeling invisible. “It’s just really easy to walk past that sort of thing… generally you just feel like you are either not wanted or you’re just invisible,” Fenn said. In a recent blog post addressing what to do when you see people sleeping rough, Launch Housing, highlighted the differences between community perceptions and the reality of people’s circumstances when it comes to the causes of homelessness. As many as 62 per cent believed that drug addition was a cause of homelessness, while in reality this accounted for just 6 per cent, whereas lack of affordable housing accounted for 54 per cent. 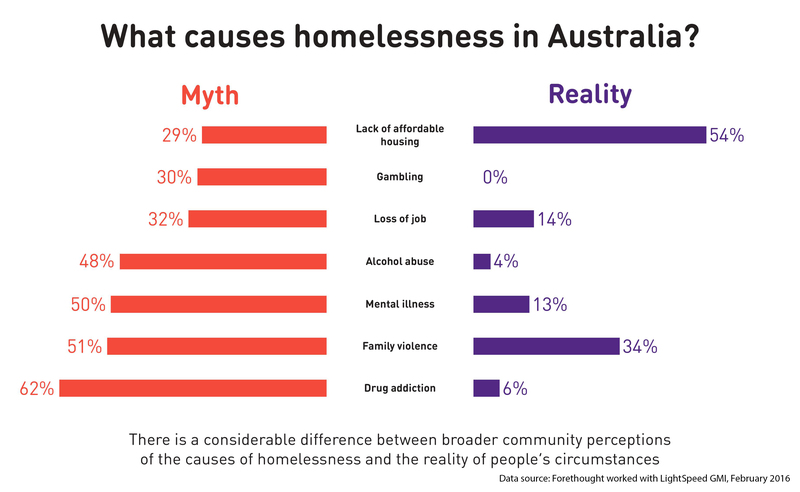 Launch Housing deputy CEO and director of services and property Heather Holst told Pro Bono Australia News one of the more enduring myths about homelessness – and something that feeds into people’s attitude to those sleeping rough – is that people choose to be homeless. “People just assume there is enough housing and that people have caused their own problems,” Holst said. “I mean look at how many reported they thought gambling was the main issue, or a big issue, 34 per cent, really it’s not, we actually found zero when we did the research. “I think sometimes you will see someone who is drug addicted and that will stick in your mind. You know it’s a sad sight, it can be sometimes even a slightly scary sight and so it sticks in people’s minds and even though the next 10 to 15 people they see won’t have anything like that going on, that one image is sort of on their brain. Holst said the public can feel confronted by seeing people sleeping rough, but if more people felt they could help, they wouldn’t need to feel upset. “I think we’re a bit embarrassed or a bit confronted for sure,” she said. “We can almost sort of feel annoyed by having our emotions pulled in a certain direction. The article, which stressed that sleeping rough was only one type of homelessness (making up just 6 per cent in 2011), pointed out: “There’s no one right way to respond, but there are some practical things you can do to help. “First and foremost, remember people who are sleeping rough are regular people experiencing a traumatic situation, so if you’d like to, introduce yourself, and ask if you can be of assistance. “If you’d like to provide food or water for someone sleeping rough – just check with them first. When it comes to practical steps you can take as an individual, Holst said connecting people with services was one of the best places to start. “I think it is absolutely fine to talk to people of course, but … you know don’t impose yourself. Don’t be pushy. Sometimes because you are in public, people think you are public property which obviously is one of the problems with having to be street homeless, you are not public property, so the better thing I think to do, apart from just being friendly, is try to throw your weight into the efforts the services are pushing already to work on this problem,” she said. Simon Benjamin, CEO of Lighthouse Foundation, which provides homeless young people with a home, said the first step is to see them as normal people. “In terms of ‘how you can help’, just think of someone who is sleeping rough as someone you may know, a normal person, experiencing a difficult situation,” Benjamin told Pro Bono Australia News. Benjamin said one lesson he had learned working with homeless young people was “not to judge”. “We have no idea what they have experienced or what led them to become homeless, as the research from Launch so helpfully tells us,” he said. Benjamin said helping people out of homelessness requires a range of supports in place. “If a young person is homeless before they become an adult, we know they are more likely to experience homelessness later in life,” he said. “Helping young people out of homelessness requires intensive work with a range of supports in place for it to be effective. Turnbull gives $2,000,000 to his Liberal Party. Fenn said finding out about the services that were available made a big difference to him. “I must admit, the first probably week or two were pretty harsh, because I didn’t know anything about the homeless services or you know food vans or anything like that but I ended up in contact with some people at St Mary’s in Fitzroy and they were great to start off with as they offered somewhere you could go and have a shower and get a bit of breakfast and a bit of lunch, and if the weather wasn’t too good you could sort of keep out of the rain for most of the day and from those guys I found out more and more about the different services that were on offer in Melbourne,” he said. Fenn, who attempted suicide during his time on the street, said the real turning point came when he realised “there were people out there were willing to put their hand out and help me up as it were”. “I had a bit of a situation where I ended up in hospital, through my own silly endeavours and I was put in contact with a spectacular person called Linda Cropley, from the Royal District Nursing Service homeless division and from there I wouldn’t say they happened overnight, but things just slowly took a better turn,” Fenn said. “[Linda] made a real effort to make sure I was going ok, I’d catch up with her and have a coffee at least once a week and she ended up putting me in contact with, it was Home Ground at that stage but Launch now, and through a great bloke at Launch, Dylan, he really put an emphasis on my mental welfare and trying to get me housing and Linda for her part she helped me get into a couple of really good places one of them being Ozanam House in North Melbourne, and I would say it was sort of slow at first but the more that I actually felt like I was a human being again, I sort of took more notice of myself and had more respect for myself. Fenn said first and foremost, helping the homeless came down to a change in attitude. “There seems to be a majority view that it’s all their fault and they can fix it right away if they choose to, whereas generally people who end up on the street, it’s taken a bit of time to get to that situation and you almost don’t really see it coming… and because… it does take a while for you to get into that situation it can take a lot of time to get back out of it,” he said. “[For] homeless people, it comes down to self respect and dignity and not feeling like they matter, and once you start to build on that and make them aware that they are worth it, that’s where the change really comes. Fenn said people don’t need to help everyone they see on the street, but a little can go a long way. “It’s not as if the individual themselves needs to do something about getting every person off the street, just… understand that it’s a situation people find themselves in, not because they want to but because of circumstances generally beyond their control,” he said. “So for me it’s about just getting the understanding out there and then once you do that, I think, going beyond just a bit of empathy, you are sort of more inclined to see homeless people as human beings and say to yourself, ‘Well that could be me, I’m glad it’s not, but that could be me, if I could throw a couple of dollars somewhere,’ or just offer something in regards to maybe helping out services, as opposed to trying to help the individual that you see in the street. Robert Gillies, who has worked alongside the homeless for several years, agreed the burden of fixing the problem shouldn’t rest with any sole individual. “Personally, the way I deal with it is I first acknowledge that I can’t help everyone, so I can’t give money and stop for a chat with everyone that I see on the streets. 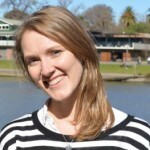 Otherwise, with the number of people experiencing homelessness in Australia, I’d (and anyone would) end up spending their whole life going from conversation to conversation, and from donation to donation, so the burden of fixing the problem shouldn’t rest with any sole individual, and we shouldn’t feel overwhelmed by guilt when we see people living rough,” Gillies said. Gillies said there were two main responses you can have when you see someone sleeping rough: help that person in the immediate moment, and then put into place a strategy for trying to make a difference on a population level, so “you can contribute towards a greater societal plan of moving towards a city with no homelessness”. “You can be generous and kind in that moment, if you would like to be. And if you can’t be, then that’s ok as well,” he said. “But kind things you can do are conversations, and helping people in any way that they might need help, which can usually be determined by asking people whether they need anything and then respecting the answer, because after all they’re in the best position to know what they need. Gillies said the key to the journey was to begin with education. As far as Fenn is concerned, just remember it can happen to anyone. Great article Wendy. Well researched and helpful in understanding how easily people can fall into homelessness. We should all be pulling together to help solve this. When you see this sort of behavior from the Leader of Australia, it is shameful! Demoralizing to the most unfortunate members in our community.